The native range of Argentine ants is northern Argentina, southern Brazil, Paraguay and Uruguay. They have been accidentally introduced by human trade to many countries throughout the world. They were first discovered in New Zealand at Mt Smart Stadium (Auckland) during opening-ceremony rehearsals for the 1990 Commonwealth Games. Genetic analysis shows that Australia was the most likely source of Argentine ants in New Zealand. It is also likely they were introduced from a single source population. Argentine ants are now relatively widespread in many North Island towns and cities, and also in several locations in the South Island. Current records of Argentine ant occurrence fit with the predictions of the recent distribution models. 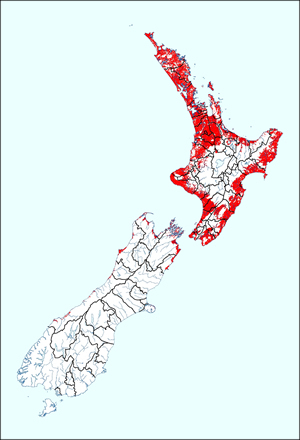 Argentine ants could potentially invade up to 20% of New Zealand, approximately 5 513 500ha. Several biological factors aid in the invasive success of this species: (i) multi-queened (polygynous) colonies that produce large numbers of offspring and rapid recruitment that lead to dominance over larger ants at food sources; (ii) an ability to exploit a diversity of habitats and food sources; (iii) a propensity for forming supercolonies through successful mixing of individuals from separate nests linked by foraging trails. Supercolony formation results in no behavioural aggression (fighting) between different colonies and populations. Fighting between colonies is the usual mechanism by which ant numbers are naturally kept in balance. Argentine ant workers move steadily in defined continuous trails and tend to walk over objects placed on trails. Their trails can often be found along smooth surfaces, and in the urban environment they are commonly found by pulling back the grass at the edge of the footpath. Foragers collect honeydew from scale insects and aphids and collect nectar from flowers. Trails can often be found ascending flowering trees and shrubs. Nests can be found under wood, stones, piles of leaves or in potted plants. In urban New Zealand, Argentine ants have become a major nuisance due to their attraction to food and sheer numbers living in houses. They infest gardens, making outdoor dining difficult. When nests are disturbed, foragers will run up legs and arms, and some people are sensitive to their bite. 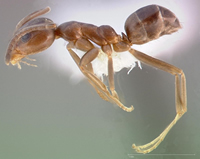 Overseas, Argentine ants can have a significant impact on the horticulture industry, particularly on citrus and grapes, and through the destruction of beehives and irrigation systems. In New Zealand, Argentine ants occur on a wide variety of common horticultural crops (pipfruits, citrus, grapes, kiwifruit, stonefruit and others), but there are no known reports of economic losses. Argentine ants have invaded numerous native habitats in New Zealand; they have been found in scrub, mangroves, costal forest and the edges of native forest. In New Zealand, Argentine ants have been predominantly sampled in urban areas and on the margins of native habitats so their potential impact on native systems remains unknown, although forest habitat appears unlikely to be utilised. In terms of their impacts on biodiversity, the primary effect of Argentine ants is the displacement of native ant species. In New Zealand, Argentine ants generally outcompete all other ant species, although there are some condition-dependent outcomes (e.g. some native species may resist invasion in colder climates). Recent research in New Zealand indicates that Argentine ants affect litter decomposition by removing invertebrates and microbes that break down leaf litter. Argentine ants may also disrupt pollination systems. Recent research in New Zealand shows Argentine ants enhance the seed-setting in boneseed, an invasive weed of coastal environments, but reduce pollination and affect seed sizes in native flax. 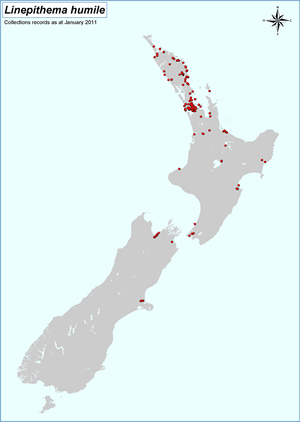 Known distribution of Argentine ants in New Zealand as of 2011. The potential distribution of Argentine ants in New Zealand using mean annual temperature and excluding unsuitable habitat categories (Ward 2009).